Forty years ago the European Convention for the Protection of Human Rights and Fundamental Freedoms came into force. It was born of the shared conviction that breaches of the most elementary human rights, such as had been experienced in the 1930s and '40s, should never be allowed to occur again. The Convention and the control bodies responsible for ensuring the observance of the engagements undertaken by the contracting States have had a profound influence on democratic European society in the latter half of this century, and have had repercussions outside Europe too; indeed the European system of human rights protection has served as a model or basic reference text for other regional systems. 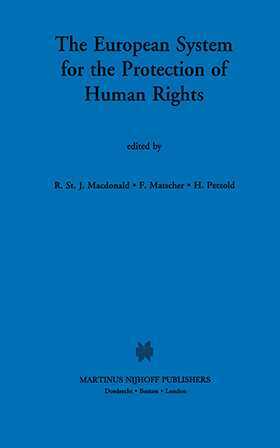 The European System for the Protection of Human Rights is a unique collection of essays by some of the most outstanding scholars and practitioners in the field of European Human Rights. Its aim is not only to sum up forty years of European experience in the collective endeavour to protect human rights, but above all to stimulate critical thinking about that experience and to review whether the Convention sytem as it stands is still fitted to meet the needs of European society in the coming millenium.